During the Children and Youth Pre-Psychosocial Support Forum, 2017, RIATT-ESA hosted a Youth Advocacy Blog Competition. The competition was part of a youth training on using social media for advocacy. About 80 children and youth participated in the training and all participants were all invited to enter the blog writing competition. Of the participants, 23 young people entered the competition by submitting an advocacy blog that calls for government and the development community to take action. We are now excited to announce the winners of the competition. 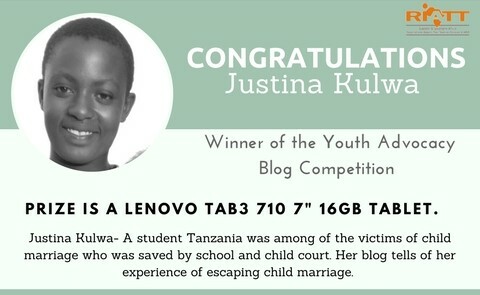 Congratulations, Justina Kulwa from Tanzania and Dulce Ana Timba from Mozambique. The prize for the winners in a Lenovo TAB3 710 7" 16GB Tablet. Click here to read more of the blogs submitted by the youth. Older PostCall for Applications: AY+ North and Central Africa Steering Committee members.